Red Meat Lovers Club is not only the name of South Florida's most carnivorous fraternity of meat eaters; not only the 12th cigar in Smoke Inn's famed Microblend Series; not only a mind-bending collaboration with one of the hottest names in the world of craft cigars (Steve Saka); but it's also the first-ever premium smoke to be intentionally blended to pair perfectly with a robust steak dinner! When Smoke Inn first introduced the Microblend Series in 2010, we were a pioneer in the now-ubiquitous realm of craft cigar collaborations. The concept was born out of our love of craft beer, where craft breweries often produce one-off batches of their most exclusive and exotic recipes. Because of their strict attention to detail and care for the craft, these microbreweries are able to focus on pure quality-over-quantity, often collaborating with other microbreweries across the country to unleash rare and supremely flavorful experiences for the die-hard enthusiast (read: us!). This is the model for which our Microblend Series was born—partnering with the cigar industry's most creative minds to unleash new and unique smoking experiences that cannot be found anywhere else! With the Microblend Series now in its 8th year running, we've partnered with Master Blender Steve Saka (owner of Dunbarton Tobacco & Trust) to unleash the Red Meat Lovers Club cigar. For this savory blend, Steve traveled to Nicaragua, meticulously assembling this cigar while "under the influence" of the country's top-grade porterhouse steaks (aka "chuleta de dos lomos"). This lead to the selection of a Connecticut Broadleaf No. 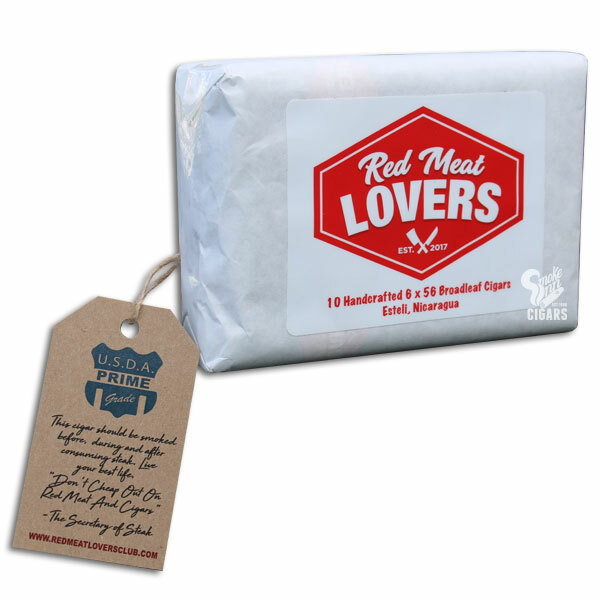 1 Dark (maduro) wrapper, which was secured over a Mexican San Andrés binder and fillers of Nicaragua and the U.S.
As with all Microblend cigars, the Red Meat Lovers Club is a one-off experience, very limited availability! Once these beasts are sold out, they're not likely to be seen again. *No promotional codes or offers available with these items.